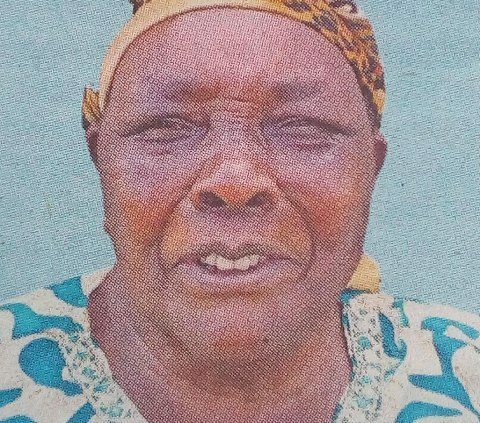 We regret to announce the death of our beloved mama Grace Nanjala Wanjala of Mitukuyu Village, Ndivisi Division, Bungoma County. Daughter of the late Mzee Watila Sumbati and the late Vilika Kharasi. Wife of the late Patrick Wanjala Namisi, co-wife of Ruth Khaoma. Mother of Dina and the late Kulova Wanjala, Mable and Stephen Chikani, Catherine and Harun Sitati, Rose and Charles Sikuku, Gladys and Cellas Wekhomba, Nancy and Mathews Namisi, Ruth and Justus Sifuma, Mary Stella and Masake Wanjala, Mary and Peter Wekesa and Judy Wanjala. Sister of Nangabo, Robert Watila, Timina, the late Rachael, the late Wataka, Lena, and the late Dinah. Sister-in-law of the late Peter, the late Wekesa, the late Nyongesa, the late Wasike, the late Okumu, Johnston, the late Richard, Ernest, Mukasa, the late Ramadhan, Kakai, Alfred, Stafford, Namusasi, the late Bunyibwa, the late Masicha, the late Nakhungu, the late Napema, Namukuru, Nafula and Natecho. Aunt of Khisa Nato, Penrose, Karani, Joseph, Khakasa, Khatete, Barasa, Makokha, Pastor Bernard, Everlyne Mweka, Muvoka, and Ben. Cousin of the late Makari, the late Mulongo, Manyonge, and Esther Simiyu. She is survived by 38 grandchildren including; Brenda, Belinda, Roy, Kimberly, Ian, Cathy, Ivy, Amy, Mike, Gadson, Brian, Sharon, Ashley, Harriet, Allison, Bradley, Rayvon, Vanessa, Wekesa, Anna, Keegan, Maua and Alysa. Fundraising will be held on Tuesday 16th April at Railways club Nairobi from 5.00 and on Thursday 18th April form 2.00 at her Mitukuyu home. The cortege leaves Lugulu Mission Hospital mortuary on Saturday 20th April. 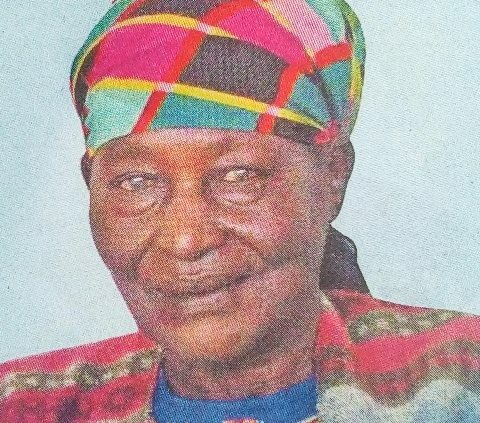 It is with deep sorrow that we announce the passing on of Mama Wilkista Nyangwara Rachier on 25-3-2019. Daughter of the late Arodi and Uba of Kano-Kakmie and sister of the late Jecton Obongo. Wife of the late Martin Rachier Oyuko. Co-wife of Mama Lucia, Eunice, and Regina. Mother of Joseph Oyuko, Juliana Odote of Co-operatives — Nyayo House, Regina Opiyo of UK, Consolata Achieng of Huduma Centre – Isiolo, Francis Opiyo of UK, Beatrice Sule of UNHCR Rwanda, the late Thomas Okello, Moses Rachier of ICRC, Elizabeth Akoth and Pauline Atieno both of Germany. Step-mother of Rose Oballa, Rita Okeyo, Antonina Nyabinda, Dr. Cecilia Rachier and others. Sister in-law of the late Jason Okiri and the late Aloyce Mbeche, Penina Obongo, and Jabuya. Mother-in-law of Pamela, Diane, the late Paula Rachier, Irene, Rose, Jacinta, Prof. Jackson Odote, Moses Sule, the late Francis Ombudo (Opiyo Sonic), Hartmut Dietz and Gerhard Schreiner. Aunt of Mwalimu Sospeter Ochieng Arodi and others. Grandmother of Bina, Lucille, Tina, Araka, Akinyi, Berylinda, Charlie, Rina, Sally, Eric, Njoroge, Roy, Joshua, Uba, Martina, Susan, Willy, Monica, Cindy, Jackie, Kysta, Gabriel, Benjamin, Marion &Thomas. Great-grandmother of Lamin, Lorraine, Leon, Akinyi, Mumbi, Sophia & Samson. Relatives & Friends are meeting daily for prayers and burial arrangements at her home in Awasi. The cortege leaves Aga Khan Hospital Kisumu on 12-4-2019 for a church service at Awasi Pentecostal Church followed by a night vigil. Burial will take place on 13-4-2019 at 2pm at her home in Awasi. For any enquiry, please contact 0720763486 or 0720573332. John 14 vs 3:And if I go and prepare a place for you, I will come back and take you to be with me that you also may be where I am. Nind gi kwe Nyar Arodi. It is with profound sorrow that we announce the sudden and untimely death of Mr. Cedric Galia Asiavugwa of Georgetown Law School, which occurred on Saturday 10th of March through the crash of Ethiopian Airline flight ET 302. Beloved husband of Linet Karimi and doting dad of Jabali Almasi Galia. Son of Mr Thomas Govedi Asiavugwa and Rosalia Kavai Litonde. Brother of Collins Govedi and Lydia Mukhana, Vincent Alusiola and Evelyn Mmbaga and Humprey Vidambu. Son-in-la w of Mr. Japheth Kungania and the Late Marycella Anampiu. Brother-in-law of Martin Kiogora, Frankline Kimathi and Mike Muthomi. Uncle of Shelton Alovi, Frankline Juniour Asiavugwa, Valentine Kavai, Kyle Mwenda and Kingsley Munene. Beloved nephew and cousin of many. Prayers and meetings are being held daily at his parent’s home at Mapera, Mawe Tatu Sub-Location in Kakamega County. A memorial service will be held at same location on Saturday 23rd March at 9.00am. For financial support to the family, use Paybill 729191. Eternal Rest grant unto him O’ Lord and let Perpetual light shine upon him. May he rest in peace. Amen! It is with humble acceptance of God’s will that we announce the untimely demise of Duncan Kamatu Mburu of Machakos County Fire Department. Son of late Daniel Mwathi Mburu and the late Esther Wangari Mburu. Husband of Marion Njeri Kamatu. Father of Kelvin Kamatu (SAJ Ceramics, Athi River) and Eric Mburu Kamatu (Simba Cement, Athi River). 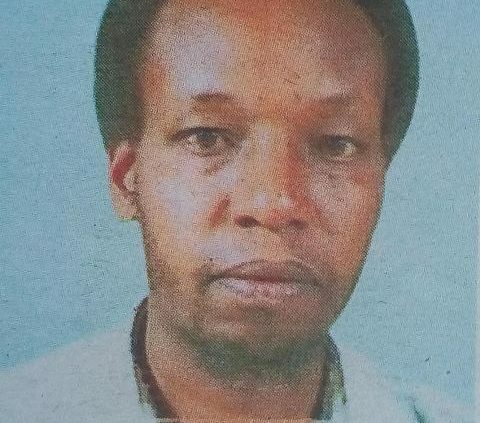 Brother of the late Suleiman Mwathi, Alfred Karanja, Ann Waithera, the late James Mbugua, the late Mercy Njeri, Sylvia Wanjiru. Step-brother of Kyalo Mburu and Petronila Kanini. Friends and family are meeting daily at their residence in Athi River Embakasi. 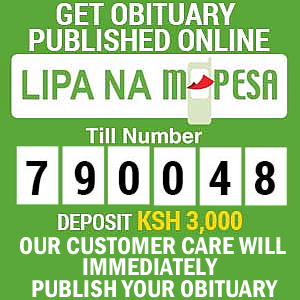 The cortege leaves Umash Mortuary at 4.00am on 22nd March, 2019 for the funeral service which will be held at PCEA Mob township church and later on burial at their family shamba in Mutirithia Molo Sub-county, Nakuru County. In God’s hands you rest, in our hearts you live forever. It is with deep sorrow and humble acceptance of God’s will that we announce the untimely demise of Dr. John Kennedy ole Lekas,. (PhD) of KALRO at Kenyatta Hospital on 12th March 2019. Husband of Mrs. Lucy W. Kennedy. Father of Janet Namunyak, Eva Soila and Rosemary Lasoi. Son of Mr and Mrs Simeon Lekasi (Enkorika, Kajiado). Son-in-law of the late Mr. Tito Njiraini and Mrs. Mary W. Njiraini. 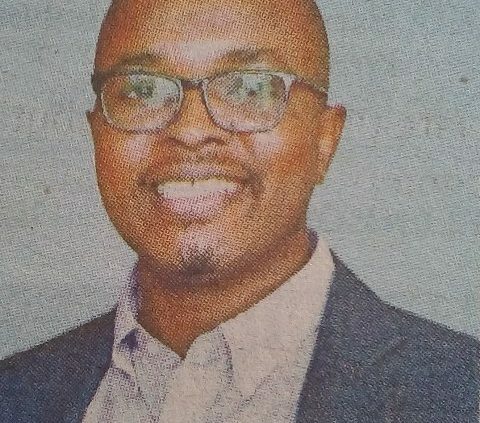 Brother of Rosemary Lekasi – Koske (KRA), Nancy Nkini (Kutuk Fashions), Stephen Oseur (Entarara High School – Loitokitok), Patrick Shira (Standard Chartered Bank), Grace Lekasi – Kimani (KRA) and Evans Leshao (WRA). Brother-in-law of Noel, Nelly, Dr. Redemptar, William, Faith, Agnes, Njoroge, the late Nyambura, Margaret, Gathu, Kibera and Njoki. Uncle of Rogers, Chebet, Chepchirchir, Sision, Brian, Kevin, Adrian, Natalie, Savio, Sasha, Trayson, Joana, Lekasi, Michelle, Lemayian, Lekuaya, Michael, Caleb, John, Jackson, Princess, Ambrose, Sidney, Njiraini, Tito, Mary, Wangari, Christine and Chris. The cortege leaves Montezuma Monalisa Funeral home on Thursday 21st March, 2019 at 8:00am for Funeral Ceremony, Holy Mass and burial at his home in Enkorika, Kajiado County; starting at 11:00am. Forever in our hearts, in God’s hands you rest. 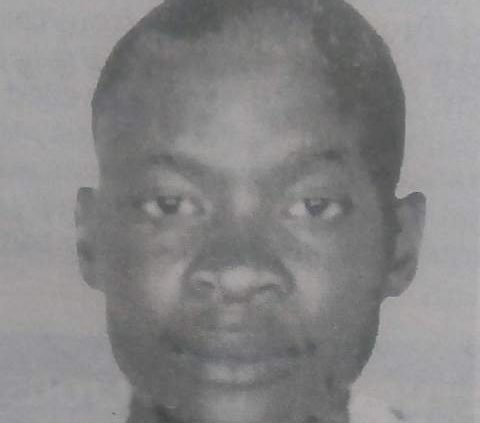 It’s with humble acceptance of God will that we announce the untimely demise of former ClIr Joseph Kanyakua Lemein which occurred at Kijabe mission Hospital on 3rd March 2019. Loving husband of Alice Nashipae Lemein. Loving Father of Timanto Lesiamon, Joyce Lemein (Afex Test Prep center) and Phillip Lekishon, (High peak School Naivasha) and Grandfather to Skye Teyian. Son to Senator Phillip Lemein and the Late Mama Zypporah Naisiae. Brother of Sereya , late Sein Kilesi, Hon Christine Masiyioi (Nominated MCA Narok County assembly), Mark Lemein, Naishorua Kamau, the late Nashipae, Hon Korei Lemein (MP Narok South), Lemita Lemein (Narok county), Koinet Lemein (CO Narok county). Family. Friends and relatives are meeting daily at his home in Motonyi and Chambai hotel Narok for funeral arrangement. The cortege leaves Umash funeral home, Nairobi on Tuesday 12th March 2019 for funeral service and burial at his home in Motonyi village Narok County. 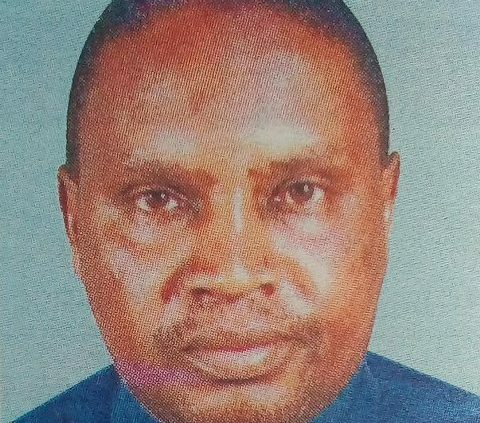 It is with humble acceptance of God’s will that we announce the passing on of Kogo Teresa Kimoi Chemweno of Kapkabai Farm, Moiben Division, Uasin Gishu County on Monday, 11th February, 2019. Daughter of the late Johana Kipyosei Rono and the late Salome Rono of Kapkong’a Village, Elgeyo Marakwet County. Wife of William Chemweno. Co-wife of Veronica Chemweno. Sister of Major Flora Chelimo, Nicholas Rono, Sylvester Rono, Divina, Petrolina and Maria. Mother of the late Anne Rono, Selina Wekesa, John Chemweno, Jacinta Murgor, Raymond Chemweno, Maurice Chemweno and Jane Chemweno. Step-mother of the late Lilian, Ambrose, Julius, Dennis, Brendan, Kigen and Judy Chemweno. Mother-in-law of the late Martin Rono, Chris Wekesa, Brigadier (Rtd) Francis Murgor, Susan, Diana, the late Margaret, Emma, Monica, Janice and Prisca. She is Survived by 37 grandchildren and 14 great-grandchildren. 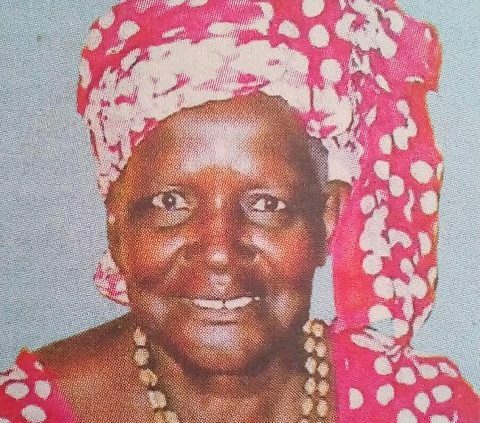 Friends and family are meeting daily at her home in Kapkabai Farm, Moiben and Sirikwa Hotel, Eldoret for funeral arrangements. The cortege leaves Moi Referral and Teaching Hospital, Eldoret on Tuesday, 19th February, 2019 at 9:00am, for church service at St. Ann Catholic Church, Moiben and thereafter overnight vigil at her home in Kapkabai Village. The funeral service and burial will take place on Wednesday 20th February, 2019 at her home at Kapkabai Farm, Moiben. 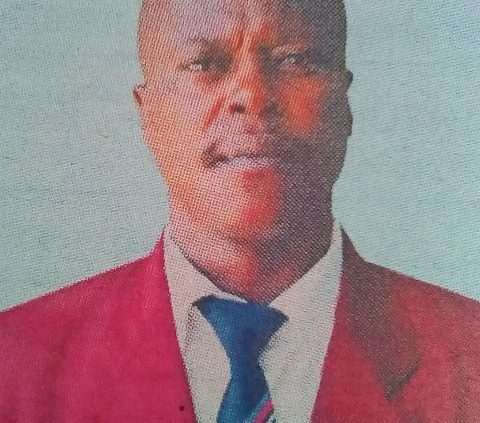 It is with humble acceptance of the Lord’s will that we announce the passing on of our beloved Eustus Moshe Young Palapala of Burendwa Primary School at St. Luke’s Hospital, Kisumu after a short illness. Beloved husband to Brigid Vugutsa Majanga (Musoli Mixed Primary School). Doting father to Joyline Waridi and Jayden Fadhili. Son of David Shivachi Palapair and Mama Jennifer. Step-son to Mama Dymphna Shiakamiri and Mama Violet Shivachi. Son-in-law to the late Naftal Khayiya and Mama Rose Majanga of Matsigulu. Beloved brother to Prof. Valerie Adema, Alexina Patricia, Sahani Khalenya, Robert Bellamine, Fredrick Masheti, Johnny-Alex Palapala, Dr. Ingatto Palapala, Elaine Dotty, Ethel Mbaka, Bushie, Hugh,Abraham, Isaac, Amos, and Jeruse. Brother-in-law to Prof. Jack Nandi, Joan Masheti, Kennedy, Alex, Lumwachi, Kevin, Cyprian, Dorin, Abedin, and Linda. Cousin to Fredrick Chimakati among others, and nephew to Sophia, Helena, Juliana, Mutsoli and the late Luvegs, the late Enrietta, the late Angelina, and the late Chrispinus Palapala. Young will be buried on Saturday, February 9th, at his home in Imutaho Village. 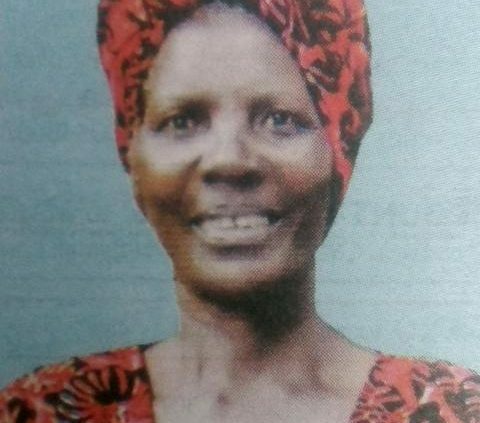 It is with deep sorrow and humble acceptance of God’s will that we announce the passing on of Madam Milkah Nyaboke Oanya of Isoge Settlement Scheme, Nyamira which occurred on 26/01/2019 at Nyanchwa Mission Hospital. Daughter of the late Mzee Mogere Nyaemo and Mama Esther Nyanduko. Wife of Reuben Oanya Omae. Mother of Phyllis Bousi (St Mary’s school Langata ) Phanice Nyougo (Kileleshwa Pri School), Samuel Nyaemo, Daniel Sabaga, Erick Asinda and Isaiah Omae (Bank of Baroda). Sister of Moraa, Peter (MTC-Kisii), Ogeto, Margaret, Mary, the late Jane, Perus, the late Leah, Fred, Sarah (USA) and Linnet. Sister in law of the late Joseph Obwoma, Samson Nyambane, Hellen Anunda the late Yunes Mochama, the late Hebisiba Gichana, Bathsheba Ouko, & Biliah Nyamosi, Agnes Nyanduko, the late John Onchana, Miriam Obwoma, the late Prisca Nyambane, the late Rose Onchana, Florence, Pastor Ayub, Jane, Kennedy, Benson and many others. Niece of the late Masese, the late Anna Mayore, the late Mosima, the late Omwamba, Okara among others. Mother in law of Evelyne Nyaemo. Cousin of Ezekiel Mayore, James Nyangaresi, Joseph Okara, Orina Nyangoso and many others. Aunt of Philip Nyagami, Emmerson (Treasury) Ezekiel Anunda, Joyce, Lydia (Lands) Kepha Ombati (Kefa Ombati & Co Adv), Benard Gesicho (KRA), Gerald Nyambane (USA),Vane Akama (Parliament), Josephat Nyamosi, Geoffrey, Nelson Onchana, Kevin Nyambati (USA), Jackson, Mike, Judy, Meshack, Brenda, Esther, Valarie, Ivy, Shirley, Tehina, Terry and many others. Grandmother of Prisca Nyanchwa, Rose Gechemba, Esther Kerubo, Natalie, Paul, Danny, Evano, Meshak, Annet, Hanson, Paulleti, Sammy, Kimathi among others. Friends and relatives are meeting daily at Tumaini House Room 5E and at her home Isoge Village. The Main Fundraising to settle Hospital Bills and Funeral expenses is on Wednesday 06th February 2019, starting 05:00 Pm at professional Centre. The cortege leaves Hema Funeral home on 07th February 2019. The burial shall take place on Friday 08th February 2019 at her home Isage settlement scheme. It is with humble acceptance of God’s will that we announce the sad demise of Peter Musyoka Munyoki of Kitui County Govt. and formerly of NSSF on 21st January 2019 at the Nairobi Hospital. Beloved son of the Late Patrick Munyoki Muimi and Mrs Catherine Kavani Munyoki of Kwa Ukungu, Kitui Central. Loving husband of Rosemary Kaindi Munyoki (MPSYGA & MoALFR). Father of Patrick, Susan, Boniface and Michael. 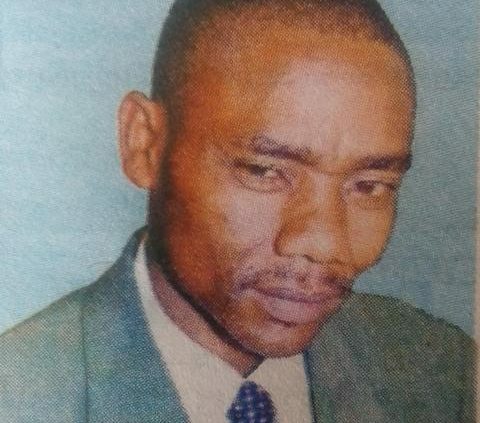 Brother of Belinda Maluki, Ann Musyoka, Joseph Munywoki, the late Sabina, the late Athanas, Bernard, Juliana, Mumbi, Elizabeth, Mwende and Evans. Son-in-law of Mr and Mrs Philip Nzou, Brother-in-law of Patrick Nzou Kaseve among others. Father-in-law of Georgina, Njoroge and Diana. Grandfather of Elsie, Michelle, Ciku, Cheche and Porsha. Nephew of the late Kavyu, Muinde, Mutinda, Malombe, Muema, Litu, late Esther among others. Cousin of Stephen Kavyu, Eng. Muthui Kavyu, Raphael Muinde, Mulinge, Monica Kimwele, Mutethya among others and Uncle of many. Friends and relatives are meeting daily at Holy Family Bascilla, St. Cecilia Hall in Cardinal Otunga Annex, from 5:30pm to 8:00pm for funeral arrangements. The Main fundraiser will be held on Friday 25th January, 2019 at the same venue. The cortege leaves Montezuma Monalisa Funeral Home on Wednesday 30th January, 2019 at 6:00am. Funeral service will be held at Nzunguni grounds and burial will be held at his home in Kwa Ukungu. May the Lord rest his soul in eternal peace. Dad, you fought a good fight, finished the race and kept the faith.